Butter an 8” x 8” baking dish with 1/4 stick butter. Layer pan with cut apples. In a large bowl mix flour, sugar, baking powder and salt. Add the egg and mix with hands to make crumbly dough. Sprinkle crumbly dough over apples. Top with 1/2 stick of butter sliced. Mix cinnamon and sugar and sprinkle over the top. Bake 30 to 40 minutes and serve topped with ice cream and whipped cream! Enjoy! 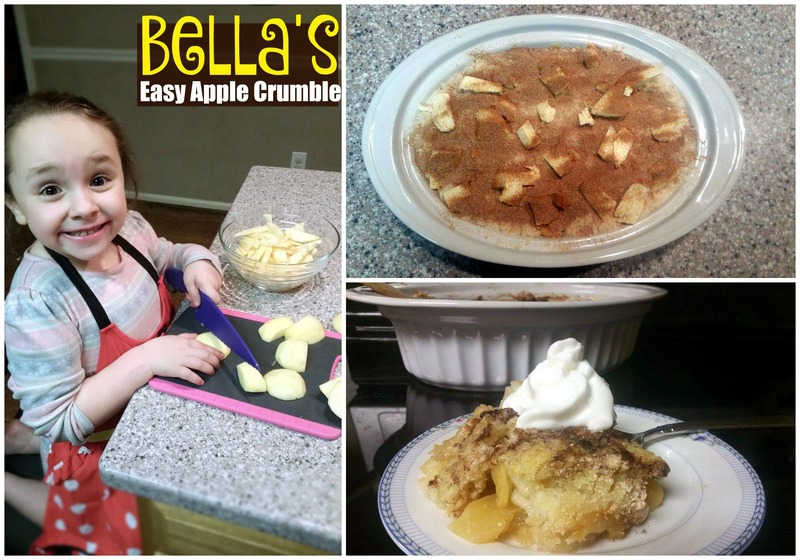 Bella — what a magnificent apple crumble! It looks delicious! That is wonderful that you have developed a love of cooking and baking so early, keep the yumminess coming! Hi Bella! You made a lovely apple crumble! It looks so good I want to make one too! Thank you so much for showing me how. I will follow your recipe and enjoy this yummy treat! Have a great day Bella! What cute cook and her dessert looks delicious. Pinned for a Sunday supper!